swann’s song: liberal leader david swann expected to resign. 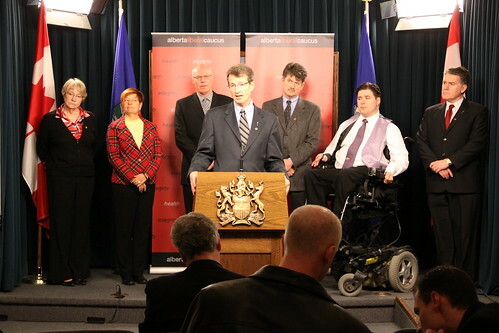 Six Liberal MLAs stood behind David Swann at this 2010 media conference. How many will stand behind him tomorrow? As first reported by Global Calgary and the Globe and Mail, Calgary MLA David Swann is expected to resign as leader of Alberta’s Liberal Party tomorrow. This announcement will take place exactly one week after Premier Ed Stelmach‘s announced that he would not lead his party into the next election. After reportedly consulting party officials about his future this past weekend, Dr. Swann is expected to officially announce his resignation to the eight MLA Liberal caucus at a 10:00am meeting tomorrow morning. One Liberal source told me tonight told me that Dr. Swann is expected to make his announcement public at an 11:30am media conference tomorrow morning at the Alberta Legislature Building. He is expected to announce that he will remain as leader until the end of the Spring Session, when a leadership contest will start or interim leader could be appointed. I am told that Lethbridge-East Liberal MLA Bridget Pastoor was shocked to learn with short notice of Dr. Swann’s intentions to announce his resignation only days before a scheduled Caucus outreach tour and major fundraising dinner in Lethbridge. Dr. Swann was elected leader in December 2008, replacing Edmonton-Riverview MLA Kevin Taft as Leader of the Official Opposition. Under the well-meaning and soft-spoken Dr. Swann, the Liberals have faced a number of problems in the form of resignations, internal party divisions, and which have manifested itself into some substantial external communications challenges, which have all been magnified as that party fell to third place behind the Wildrose Alliance in public opinion polls. Sources tell me that Edmonton-Gold Bar MLA Hugh MacDonald is likely to seek the Liberal Party leadership. This entry was posted in Alberta Politics and tagged Bridget Pastoor, David Swann, Ed Stelmach, Harry Chase, Hugh MacDonald, Kent Hehr, Kevin Taft, Laurie Blakeman on January 31, 2011 by Dave Cournoyer. I respect David Swann as a nice man but he’s not the leader that the Liberal need. Hugh MacDonald isn’t that person either. Who do they have left? First Ed Stelmach, then Ted Morton, now David Swann. I guess I’m not shocked that the Liberals are taking their cue from the BC NDP. They forced Carole James out without an heir apparent. Now they are doing the same to Swann. Times are a changin. In with the new and out with the old, I guess. The Liberals are done. That’s a shame. He’s a smart guy. I hope he doesn’t resign. David Swann is one of the most honest politicians I ever met. His party is down in the polls and there is a lot of room to swing back with the Tories picking a new leader. It is unfortunate that MLAs would work to undermine him. Too bad Swann never got a chance at an election. I’m sure MacDonald is a solid MLA and about as senior as they get in that Liberal party but they need someone from outside the party to come in. They need a fresh face in the worst way possible. The whole Alberta Party concept is nice but I’m still more inclined to support a party like the Liberals with a history and machine and experienced MLAs. 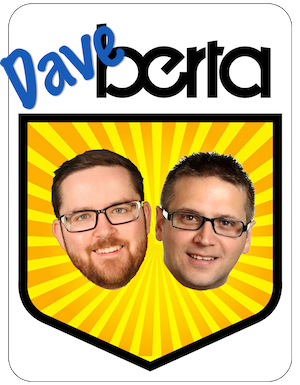 I have no reason yet to vote for the Alberta Party beyond the whole “ooh new and shiny” factor. This whole incident reminds me of what the Liberals did to Ken Nichol back in the early 2000’s. Here was a genuinely good person and hardworking MLA who just wasn’t flashy enough for the big city and big money Liberal party fundraisers. They forced him out. Think the same didn’t happen to Swann? Think again. At least the Liberals had Taft to replace Nichol. Who do they have now? I think it comes down to the fact that Swann was never comfortable in board rooms and with big oil. You can’t form government in this province unless big oil likes you, it’s as simple as that. Stelmach, one of the largest landslide victories in history but not well liked in the oil patch – nuff said. David Swann is a great person and would have brought a desire for evidence-based decision making were he ever to become premier. I would also add that he was a democrat almost to a fault. He had many personal principles that he comprimised because he listened to his party members and to caucus probably too much. In theory we all want democracy but in reality we all want to be lead by a strong leader who makes decisions for us and tells us how to behave. Stelmach is gone. Swann is gone. Now we can only hope Danielle Smith goes next. David is a very honest, caring man. He was up meeting the Indigenous people at Fort Chip. He really cares about the “little” people. He understands the issues in health care– reduce pollution and you get less strain on the health care system. Get people off the streets and you free up more beds in hospitals etc. We need more politicians like him. We wish David all the best in whatever happens. Not sure if this is common knowledge or not but “big oil” isn’t able to cast a vote. Who can cast votes are all those individual people who have an income that depends on the oil and gas industry, and there are a lot of those people, more of them than those whose incomes depend on government funding. If the Libs or NDP want to make any ground, they’ll need to look at developing policies for this demographic. When the Liberals elected Swann as leader, all the Tories had to do was to change the name on their “How To Contain Kevin Taft” political playbook. In this case, a change in leadership made no difference in party policy or approach. That’s the shoe people are waiting to drop for the Tories, not who leads the party but whether or not new leadership will mean a new direction and a change in policies.